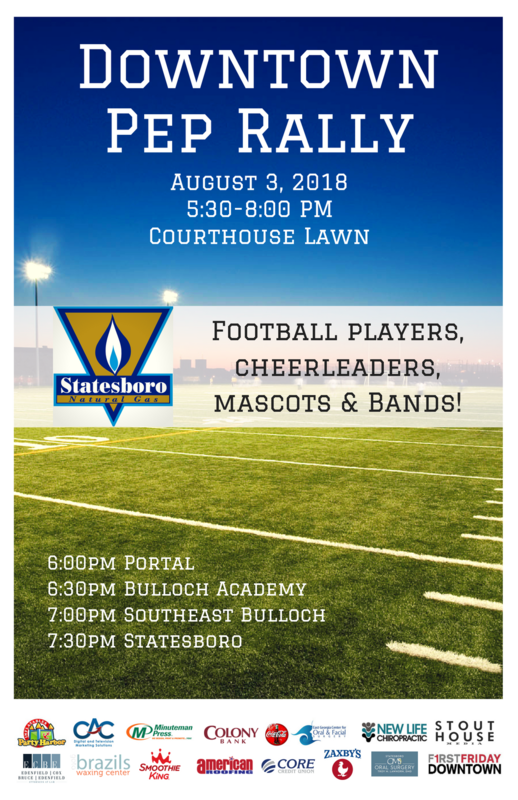 Bulloch County High Schools kick off the 2018 football season at the 10th annual Downtown Pep Rally First Friday August 3 from 5:30-8 pm on the Courthouse lawn. Tommy Palmer with Georgia High School Scoreboard will introduce the teams and interview coaches and players about the upcoming season. This year’s schedule of appearance is as follows: 6:00 p.m. Portal High School, 6:30 p.m. Bulloch Academy, and 7:00 p.m. Southeast Bulloch High School and at 7:30 p.m. Statesboro High School. Join the cheerleaders and pep bands and cheer for your favorite team. Statesboro Natural Gas proudly sponsors this event by providing free hotdogs and lemonade for all of the teams. There will be food trucks, funnel cakes, frozen treats and local vendors set up on Siebald Street. Children can enjoy jumping for free in a Party Harbor bouncy. 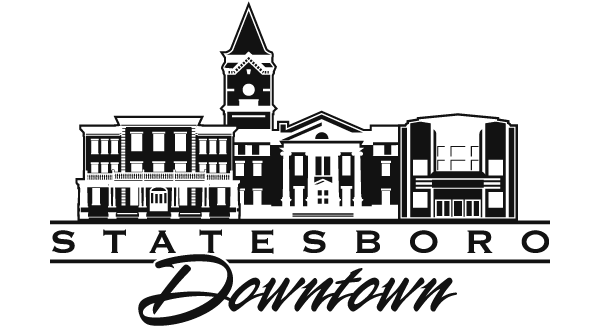 The Downtown Statesboro Development Authority will sell Downtown Statesboro t-shirts for $15 and reusable Downtown Discount cards, featuring 18 different businesses for only $10 valid until April 2019. For more information, please contact the Downtown Statesboro Development Authority by calling us at 912.764.7227 or emailing us at mainstreet@statesborodowntown.com. Yes, I would like to receive emails from Main Street Statesboro. Sign me up! Welcome to Statesboro, Georgia - home of the Blue Mile, Georgia Southern University and true Southern Hospitality! We invite you to enjoy the best of Statesboro by visiting Downtown where you will find the best restaurants, shops, and businesses.